Chookasian Armenian Concert Ensemble has been presenting traditional Armenian music, dance, and culture since 1994. Their concerts draw on classical, folkloric, and troubadour music from both eastern and western Armenia. 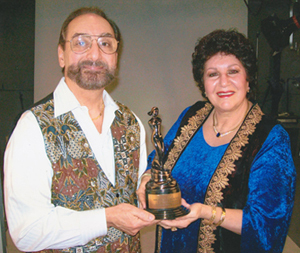 The ensemble received the National Gold Medal Award from the Republic of Armenia during their tour in 1999, won the award for Best Traditional Armenian Folk Music at the Armenian Music Awards Ceremony in Los Angeles in 2009. The ensemble includes founder John Chookasian on clarinet, Barbara Chookasian on lead vocals, Hovanness Shabazyan on vocals, Valod Grigorian on kemenche (folk violin), John Tarpinian on oud (fretless lute), Norik Manoukian and Garen Sarkissian on shvi (piccolo folk flute), Hayk Nalbandyan on dumbeg (hand drum), Albert Vardanyan on duduk and zurna (folk flutes), and Vergine Alimian on kanun (lap harp), tarr (double-bodied lute), and saz (fretted lute).